Subscribe to our newsletter for updates from the healthcare sector or use the form below to contact us with any questions or concerns. Repeated trips to the hospital can be both costly and burdensome for patients and caregivers. Each one of our wheelchairs is engineered with preventative safety measures in mind, stopping acute complications before they occur. Every body is different, and our patients are no exception. Our wheelchairs are built with adjustable functions so you can tailor your wheelchair to fit your needs and your body. Never worry about audits or policy changes again, as our paperwork extensively covers the required medical documentation by Medicare to make sure your patient's medical equipment needs are met. Our online referral system integrates closely with EMR and EHR systems. Reduce your workload. Send once. Receive once. Every patient is different. Different conditions necessitate different equipment for completing Mobility-Related Activities of Daily Living (MRADls) and leading a happy, functional life. All our wheelchairs are built to be infinitely customizable in order to meet the differing needs of patients. Every single one of our wheelchairs is designed with prevention in mind as well, keeping patients at home and out of the hospital. When it comes to your patients and your loved ones, a little can go a long way. We provide a number of features for our wheelchairs that increase both the comfort and safety of our patients. Pressure ulcers can begin to form in as little as two weeks and typically occur within the first four weeks. A study by the University of Pittsburgh found that patients using skin protection cushions were significantly less likely to develop pressure ulcers than the average patient in a skilled nursing facility. Wheelchair cushions evenly distribute pressure and reduce moisture build up to prevent skin breakdown and stop pressure ulcers before they begin. Over 100,000 wheelchair-related injuries occur each year, with tips and falls accounting for 65-80% of those injuries. Wheelchair safety is important and for many aging individuals, it's not a question of if they'll fall, but when. Anti-tippers can be invaluable in preventing potentially fatal skull fractures at an extremely low cost to both patients and providers. Wheelchair seating is not a static activity, and if you're using a wheelchair often, posture is everything. Height adjustable armrests allow you to dictate how you use your wheelchair, not the other way around. Slide them up when you're watching your grandson's football game, or slide them down when it's time to have snack. As much as your wheelchair is built to move, it also needs to be built to stop. When it's not in motion, it needs to serve as a comfortable chair that you can rest easy will stay in one place. For many, the standard brake handles that come with your chair may not be long enough, causing you to have to lean forward and reach pull the handles. For patients with a variety of issues, this could be problematic. The locking brake extensions we supply on each and every one of our chairs provide a boost in both comfort and strength when at rest in your chair. Some injuries and conditions may require you to elevate your legs to promote healthy circulation and even out blood flow to different areas of your body. This is where elevating leg rests come in. These leg rests allow a patient to fully extend either of their lower limbs, allowing your wheelchair to provide you with the support you need. And if you injury changes? Or if you need to re-situate yourself? No problem, our leg rests are built to move just like you and can change positions with the pull of a lever. For patients at a particularly high risk for developing pressure ulcers and wounds and who are not able to perform functional weight shifts independently, a fully reclining back rest allows their caregiver to assist in performing a functional weight shift, preserving skin integrity. When it comes to preventing pressure ulcers, maintaining constant movement is everything. Skin breakdown can occur swiftly if the appropriate preventative measures are not taken. Download PDF forms to fill out on paper or on a computer, call, or send a fax. Documentation cannot be written as a prescription. Documentation must be a part of the medical chart/record (including progress notes, d/c summary, etc). Documentation must be completed and signed by an MD, RN, NP, PA, Therapist (PT or OT), or LCSW. WOPD must be signed by an MD, DO, NP, or PA.
Our walkers are built to be walked with. No matter where you need to walk, no matter how you plan to get there. Pair one of our walkers with a Gel Mattress Overlay (works with any bed) for improved support and pressure ulcer prevention. Medicare requires you to state the patient's precise mobility limitation to document why the patient needs a wheelchair. Be specific. Some facts about the patient's condition may seem obvious to us, but since Medicare doesn't see the patient on a daily basis, thus they need a more detailed explanation. Make sure to state what activities the patient is unable to perform and how their condition prevents them from performing these actions. Explain how using a wheelchair will make the patient more able to complete daily tasks. Also make sure to state that the patient's impairment cannot be resolved by the use of a cane or walker. Medicare requires that each patient who gets a wheelchair is able to safely use it in the confines of their own home. Not all home arrangements are suitable for wheelchairs, so it needs to be identified that the patient (or a caregiver) is willing and able to safely operate a wheelchair in the home. If the patient requires a wheelchair larger than the standard size, medical notes must document the patient's seated hip measurement to specify the need for a larger wheelchair. 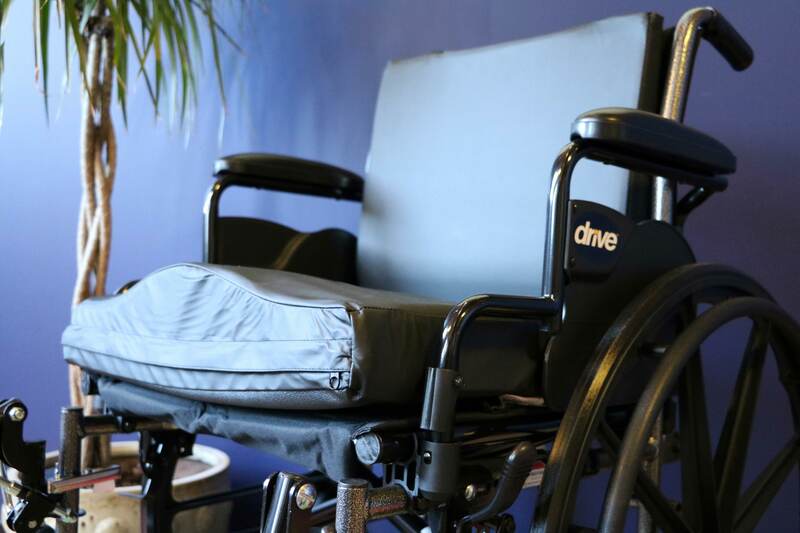 All patients who qualify for a wheelchair qualify for a general use seating cushion. Patients at a heightened risk for pressure ulcers may also qualify for a moisture reducing skin-protection cushion. The patient has limited mobility. The patient's MRADL’s are significantly impaired. The patient's impairment cannot be resolved by the use of a cane or walker. Using a wheelchair will improve the patient's participation in MRADL’s. The patient can safely use a wheelchair in their home. The patient cannot propel in a standard wheelchair, but he or she can self-propel in a lightweight wheelchair. If the patient requires a 20” wheelchair, their seated hip width must be greater than 19". The patient or caregiver is willing to use the wheelchair in the home.